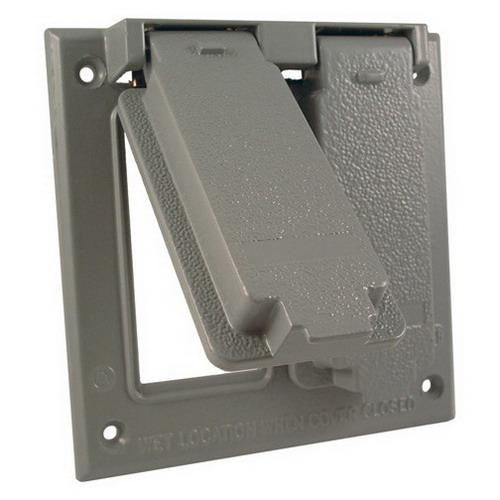 Raco TradeSelect® Bell® 2-Gang Self-closing device cover in gray color, is suitable for use with weather-proof device box. It features rugged die-cast metal construction for longer endurance and state-of-the-art powder-coated finish for maximum weatherability. Square cover measures 4-3/16-Inch x 4-1/2-Inch. It has self closing lids that ensure weather-proof protection when the receptacle is not in use. Cover with two GFCI receptacles configuration, supports box mounting. Cover is UL/cULus listed, NEMA 3R rated and meets NEC article 406.9A standards.